Homemade chicken stock is quick and easy to make. 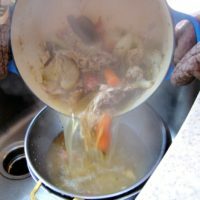 If you’ve never made your own chicken stock before you’ll be surprised not only by how easy it is, but how much of a difference it makes in your cooking. While store bought chicken broth is ok, it can be quite salty and doesn’t have the body and full chicken flavor of a stock you make yourself. 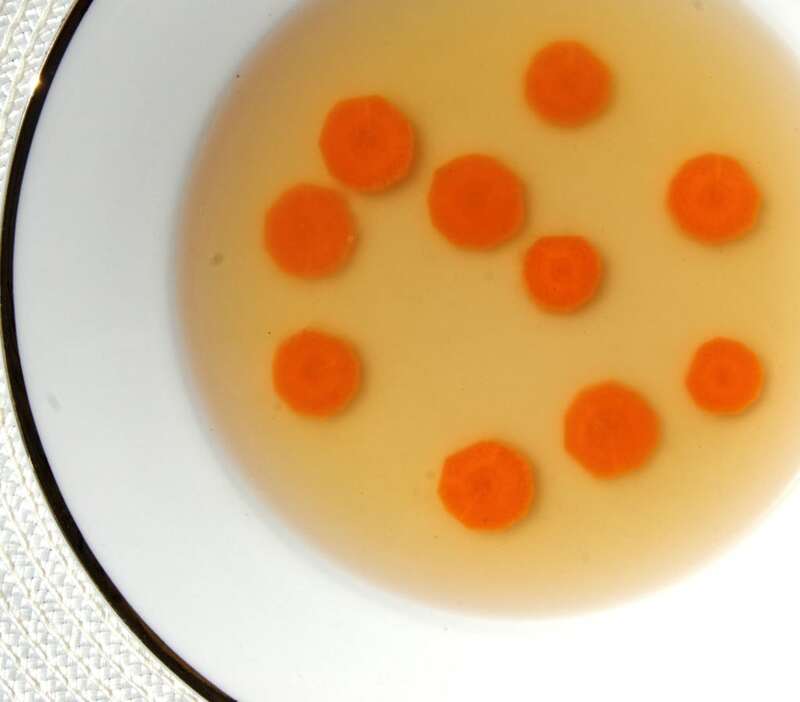 Commercial broth that you buy in the store is generally made with chicken fat and wheat gluten, whereas your homemade stock is made with inexpensive chicken bones and basic vegetables that you probably already have in the house. Homemade stock has great chicken flavor and is low in calories. If you take the extra step of leaving the strained stock in the refrigerator over night you can scoop off the fat and have a low fat and healthy base for many great dinners. 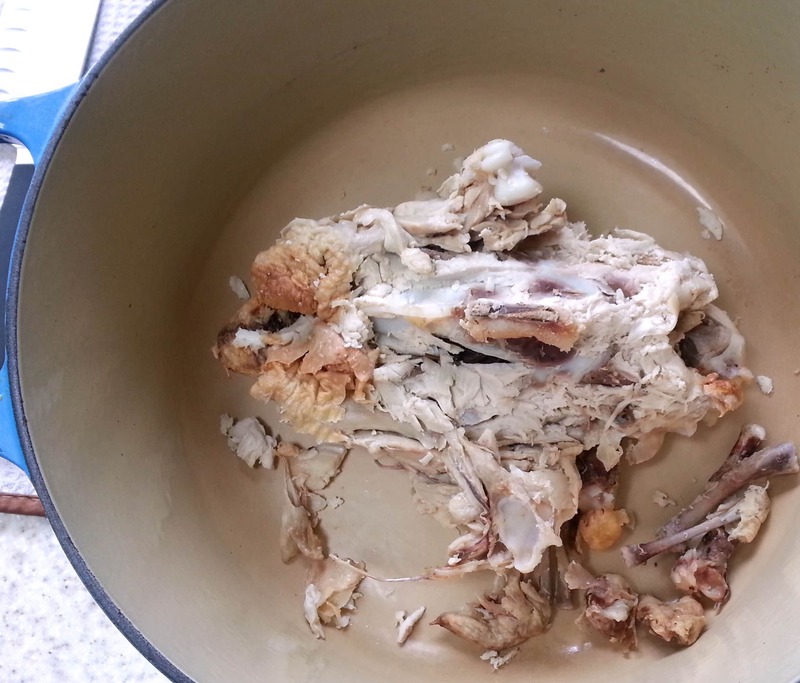 Whenever I roast a chicken I keep the left over carcass to make a pot of stock. If I don’t have any leftover chicken bones I buy cheap chicken wings to make the stock. Some good butcher counters may have chicken bones that you can buy for stock. 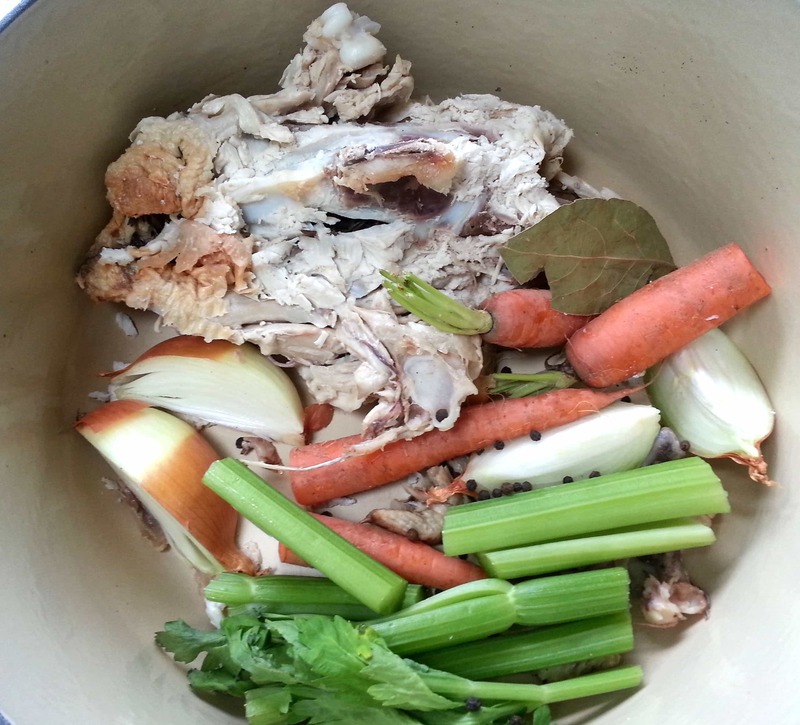 The left over carcass from a roasted chicken is the perfect starting point for a great chicken stock. Add the unpeeled vegetables and aromatics to the pot. Cover the chicken and veggies with cold water. Strain the stock into a colander set over a large bowl. Discard the bones and veggies. I freeze stock in quart and pint containers. I always try to keep a few containers in the freezer. I use this stock as the base for my chicken pot pie. The pot pie takes a little time and is something I’d usually make on the weekend when I have more time to cook. But if you’ve already got the stock in the freezer, throwing together weeknight dinner is quick and easy. I just go through the fridge and freezer and use whatever veggies I’ve got. Add a can of tomatoes or beans and you’ve got a tasty and healthy soup in no time. Chicken stock has so many uses beyond soup or stew. I use it to make gravy, risotto, rice pilaf, as a base for stir fry sauces and I love barley simmered in chicken stock as the base for a really tasty and healthy salad. Place the chicken, the vegetables and aromatics in a large stock pot. Heat over medium high just until it begins to a boil. Lower the heat to medium low and simmer, uncovered for about 2-3 hours. 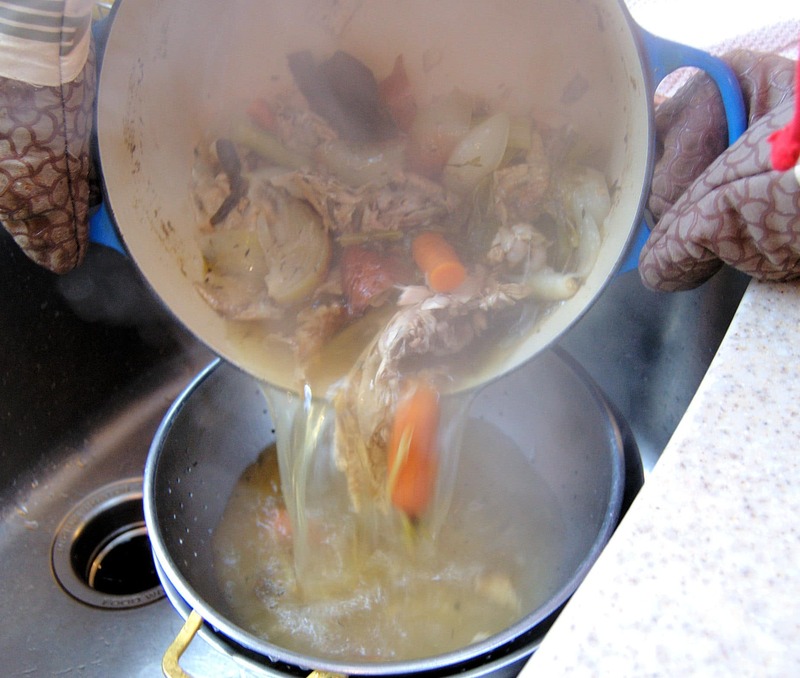 If the water evaporates add more cold water to keep the chicken and vegetables well covered. Cook until the chicken falls apart and the stock has a nice golden color and good chicken aroma. Turn off the heat and allow the stock to cool a bit. Set a large colander into a large bowl and strain the stock. Discard the bones and vegetables. 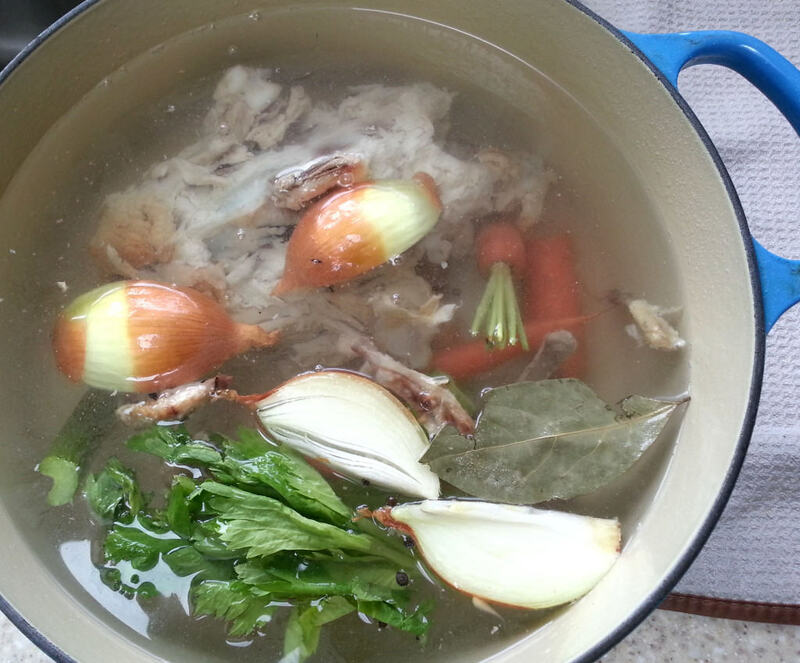 To defat the stock, set the bowl in the refrigerator over night then remove the solidified fat from the stock. Pour into containers and freeze. The stock will keep in the refrigerator for 3-4 days. The frozen stock will keep for several months. I don't add salt to the stock since each recipe will add salt as needed. You can make a stock with just the chicken bones and no vegetables or you can make a vegetable broth with no bones and just vegetables.